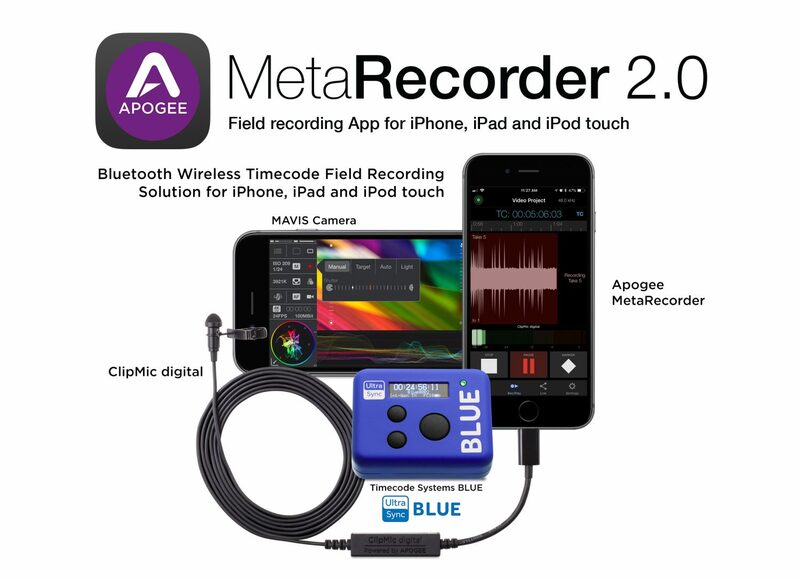 October 18th, 2018 – Santa Monica, CA – Apogee is proud to announce the release of MetaRecorder Version 2.0, the first two-channel audio recording app for iPhone, iPad and iPod touch to offer intuitive multi-take recording, tagging and file organization for any field recording scenario. Version 2.0 adds support for the new UltraSync BLUE module by Timecode Systems with an in-app purchase along with updated compatibility with new Apogee products like Jam+ and MiC+. With the additional purchase of the UltraSync BLUE module iOS users can wirelessly sync audio and video from up to 4 devices over Bluetooth with a range up to 10 meters. The BLUE timecode protocol is currently compatible with two iOS apps: Mavis Camera and Metarecorder. Once the Bluetooth connection is established within the Mavis Camera app (for video) or Apogee Metarecorder (for audio) each connected device will be synced and ready for recording. Timecode from BLUE is automatically embedded in the media files’ metadata for easy sync when using your favorite Mac editing app.